LEATHER is a durable and flexible material created by tanning animal rawhide and skin, often cattle hide. It can be produced at manufacturing scales ranging from cottage industry to heavy industry. People use leather to make various goods - including clothing (e.g., shoes, hats, jackets, skirts, trousers, and belts), bookbinding, leather wallpaper, and as a furniture covering. It is produced in a wide variety of types and styles, decorated by a wide range of techniques. Epi leather - introduced by Louis Vuitton in 1985 epi leather is dyed all the way through and has a grained texture. LEATHER & Luxury - "Magazine published in Italian and English that illustrates the complex world of leather goods in detail, turning the spotlight on the real stars of 'Made in Italy' ... 'the artisans'." MIPEL - launched in 1962. "The Bag Show." Milan, Italy. The world’s leading international leather-goods show: bags, luggage, sacks, wallets and the full spectrum of leather accessories. Morocco leather - leather, traditionally this is goatskin leather prepared for softness & decorative finish. Nappa leather - leather, typically dyed, made from kid-, cow-, calf-, lamb- or other skin by tanning. It is noted for its soft temper. Ostrich leather - leather from an ostrich. Patent LEATHER - leather with a high gloss and shiny finish. Saffiano leather - the leather is made is by a stamping method. Saffiano, being a textured leather, meaning that it is a treated leather made with the texture pressed on it by a machine. It gives the leather a cross-hatch finish, which is a special diagonal pattern. This calf hide leather is also finished with a wax treatment. As a result, the leather is pretty much scratch resistant, durable and easy to clean. THE LEATHER CONNECTION - "A Massive Leather Research & Reference Site." Top Rated Leather Brands - Ranker. Would you wear leather that's grown in a lab? - "Imagine wearing leather goods that haven't been made from livestock. That's what startup Modern Meadow has created: a material it says is 'biologically similar to leather' but doesn't cost the life of a single cow." ACQUA DI PARMA - since 1916. "The excellence of Italian craftsmanship." Leather collection. Akris - founded in 1922. Swiss fashion label specializing in luxury goods for women (ready-to-wear, leather accessories). Armani - since 1975. Italian fashion house founded by Giorgio Armani. ARTIOLI - since 1912. "Artioli creates a wide range of leather products according to the same high quality standards." ASPINAL OF LONDON - since 2000. London designer, manufacturer and retailer of luxury leather goods and accessories for men and women. ASPREY - "The British Standard since 1781." Luxury leather goods. ASTON MARTIN - since 1913. Luxury leather goods, and more. BERLUTI - since 1895. Subsidiary brand of LVMH known for its unique leather finishing. including of leather goods such as belts, bags, and wallets. BILL AMBERG - since 1986. Luxury leather bags, designer leather accessories, designer luggage. BOSCA - since 1911. "Fine Leather Goods & Accessories." Bottega Veneta - "Discover the world of Bottega Veneta. Discretion, quality, and unsurpassed craftsmanship - a new standard of luxury since 1966." BRUNO MAGLI - since 1936. "Classic Italian Luxury, Redefined." Italian luxury brand that specializes in shoes and leather goods for men and women. The brand has catered to loyal customers throughout its 80 year history including celebrities, royals and fashion elite and continues to evolve its heritage by reinventing luxury essentials for a new generation. BVLGARI - since 1884. Italian jewelry & luxury goods brand. Burberry - since 1856. British luxury fashion house. Men's & women's luxury leather goods. CARTIER - since 1847. "Cartier has a wide range of elegant leather goods to offer you." Chanel - since 1909. Women's small leather goods. COACH - "New York Luxury Brand Est. 1941. "We went on to define 'accessible luxury' for a generation. Beginning in North America, Coach delivered an alternative to traditional luxury. Then, we expanded beyond our home market, becoming the first American company in our category to bring international relevance to an American leather goods brand." CORTER LEATHER & CLOTH - since 2008. "A two person leather goods company hand sewing on Cape Cod, Massachusetts." dahlman1807 - since 1807. "We have been making high quality leather goods in the heart of Copenhagen since Dahlman was founded by Master Saddle Maker Wilhelm Ludvig Dahlman in 1807. Today we are just as committed to create beautiful handcrafted products as our predecessors, celebrating old and proud traditions in a contemporary context." Dior - since 1946. Men's & women's leather goods. DUNHILL - since 1893. British luxury goods brand, specialising in ready-to-wear, custom and bespoke menswear, leather goods, and accessories. The company is based in London, where it also owns and operates a leather workshop. ETTINGER - since 1934. "Founded by Gerry Ettinger over 70 years ago. We are one of the few remaining British luxury leather goods companies still manufacturing in the UK." FENDI - founded in 1925 as a fur and leather shop in Rome, Italy by Adele Casagrande. Florence Leather Market - "The uniqueness of Italian styles with just one click." Wide variety of handcrafted, genuine-leather goods made in Italy. FORZIERI - since 1999. "In a world where so much is becoming monotonous, there are still places where the thrill of style discovery can be experienced." GANZO - since 1917. Small Japanese luxury leather goods brand - "delivers the world's best finished leather products." Giorgio G - founded in 2000 by Giorgio Gucci. "Giorgio G lives the tradition of fine artisan crafts and Italian style. We make classic and modern leather goods and accessories – from handbags to foulards, from purses to pochettes." Giorgio Armani - since 1975. Italian fashion house which designs, manufactures, distributes & retails haute couture, ready-to-wear, leather goods, shoes, watches, jewelry, accessories, & more. Greenwich - "Luxury Handmade Leather Accessories." Greenwich is about producing the cases we really want to make without the usual cost constraints imposed by large, margin-hungry retailers and brands. Shop our beautiful collection of small goods and everyday accessories, from luxury handmade wallets to sophisticated leather purses and a selection of travel accessories which includes cable tidies, passport holders and slimline wallets. GUCCI - founded in 1921 in Florence, Italy by Guccio Gucci. 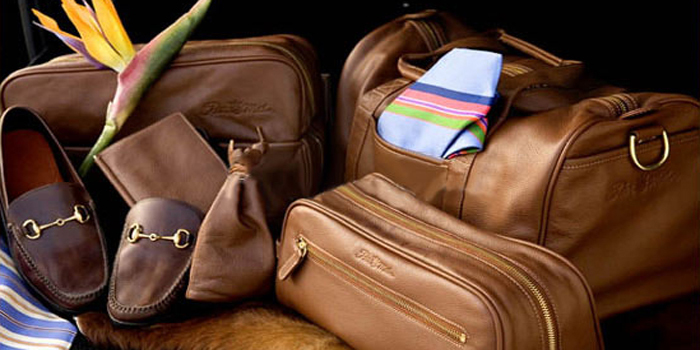 One of the world’s most successful manufacturers of high-end leather goods. HERMÈS - founded in 1837 in Paris, France by Thierry Hermès. Specializing in leather, lifestyle accessories, perfumery & luxury goods. House of Florence - founded by Roberto Gucci. "A fresh bud flowers on an ancient tree." Where style is at home. Each article is the result of a refined selection of high quality materials, coupled with ancient artisan tradition. The collections are realized with particular care both in the choice of the colors and in the combination of different materials. J.M. WESTON - French luxury company in founded 1891. It is renowned for its handmade shoes for men. They also produce a full line of leather goods ranging from belts and briefcases to luggage items. J.PRESS - since 1902. "J. Press Is for the Ivy League Faithful." Leather goods. JIMMY CHOO - since 1996. Women's small leather goods. JOHN LOBB - since 1849. "We are able to make any type of leather goods to order including variations of existing products." KENNETH COLE - since 1976. Men's & women's leather bags & luggage. LACOSTE - since 1933. Men's & women's small leather goods. Launer London - since 1941. "Elegant handbags and accessories in the finest leather. Made in England." The Queen has been a loyal customer of the handbag brand for over 50 years - she awarded the firm the Royal Warrant in 1968 - and has four new bags made especially for her every year. LEDERER DE PARIS - the leading luxury leather store that has been gracing the fashion industry in Paris, London and New York since 1898. At eBay. LORO PIANA - since 1924. "The pursuit of excellence has been its mission for six generations." Loro Piana operates in the industry making uncompromised quality its mission with a complete selection of ready-to-wear, accessories and gifts. LOUIS VUITTON - founded in 1854 in Paris, France by Louis Vuitton. One of the world's leading international fashion houses & the world's most valuable luxury brand. Makr - since 2007. "Made in the USA." Handmade leather goods. MARK CROSS - since 1845. "America's First Luxury Leather Goods Brand." MARTIN DINGMAN - since 1990. "Leathergoods for Life." MCM | MODE CREATION MUNICH - "Luxury Leather Goods." German brand of leather products founded in 1976 in Munich, Germany. MONTBLANC - since 1906. "Enter the realm of Montblanc's impeccable leather pieces created by the finest-skilled craftsmen and discover the unique beauty of our leather goods." MULBERRY - fashion company founded in England in 1971. "Our small men's and women's leather goods are designed for every style and sensibility. Explore purses, wallets, zip around purses and slim card holders." Nappa Dori - since 2010. "Finest quality genuine leather Products. Hand-crafted by Traditional Artisans." Every handcrafted piece of Nappa Dori accessories or luggage is an expression of fine individuality. Embellishments adorn materials in subtle sophistication, carefully balanced to make a distinct statement. Nicholas Haslam Ltd - established in 1980. "This is continental chic at its most accomplished." PAPYRUS - since 1984. "Fine Bespoke Leather Accessories." Pineider - Firenze 1774. "Pineider offers a wide range of leather goods made with the very best materials and a timeless style, crafted in accordance with italian traditions, dedicated to men, women, baby and travel." Prada - since 1913. Italian luxury fashion house, specializing in ready-to-wear men's & women's leather and fashion accessories, shoes, luggage, perfumes, watches, etc. SAGE BROWN - "Luxury leather goods." Quintessentially British in character, Sage Brown is a modern family run company specialising in luxurious fine leather goods for discerning ladies and gentlemen. SALVATORE FERRAGAMO - Italian luxury leather goods company founded in 1927 in Florence, Italy by Salvatore Ferragamo. Shinola - since 2012. "Leather Goods Made To Last A Lifetime Or Two." Real leather goods online for men and women. Leather goods and accessories, designed and developed in our Detroit studio. SMYTHSON OF BOND STREET - since 1887. "Over 125 Years of British Luxury Leather Goods." STANDARD LEATHER CO. - "Founded in Southern California Standard Leather Co. emerged from the essential need to create. Focused on top-quality products made with premium leather and the strongest hardware; Standard Leather Co. is the result of the endless pursuit of handmade perfection." Stefano Ricci - since 1972. "Refined small leather goods for men made in Italy by STEFANO RICCI: travel bags, wallets and pouches, for true connoisseurs who love superior accessories." Stow - "STOW brings a fresh perspective on luxury leather travel accessories. Established in 2013, our products are designed in England and hand-crafted in Spain by artisans using only the finest materials available." SWAINE ADENEY Brigg - since 1750. "250 Years' of British Craftsmanship." Over the centuries, Swaine Adeney has perfected their traditional and sophisticated designs, rendering them a world-class British manufacturer of the highest quality, and with leather goods lasting for generations. Our luxury leather products provide a practical solution for both everyday use and special occasions. The Bridge - "Firenze 1969." We have been mixing tradition with innovation preserving the handcrafted nature of each product as much as possible. Makers of handbags and accessories featuring a highly characterised style, where the value of ‘Made in Italy,’ contained in the typically Florentine workmanship. Tod's - since 1920. "Enter the world of Tod's and discover the excellence of quality and craftsmanship Made in Italy, expressed in the unique style of shoes, bags and accessories." Tony Perotti - "Since 1970, Tony Perotti Italy has produced superior quality; handcrafted classic leather creations that combine fashion and modern functions. Tony Perotti is an Italian designer committed to offer exceptional quality and functionality in each item." Troubadour - since 2011. "London-based modern brand specializing in designing and creating superior handcrafted leather goods." TUSCANY LEATHER - since 2004. "Italian leather bags and accessories. Made in Italy." Versace - since 1978. Men's & women's small leather accessories. WANT Apothecary - since 2011. "Luxury leather travel and lifestyle accessories brand."